Leaf and Debris Pool Covers - Are They Right For You? You are at:Home»Pool Covers & Rollers»Leaf and Debris Pool Covers – Are They Right For You? Leaf and Debris Pool Covers – Are They Right For You? If you want to close your pool for the winter. How Are They Different From Other Types of Pool Cover? To a greater or lesser extent, all types of pool cover benefit your pool in so far as they all reduce evaporation, reduce chemical loss, and reduce cleaning time by preventing leaves and debris from easily entering the pool. However, each type of pool cover has a different primary function. 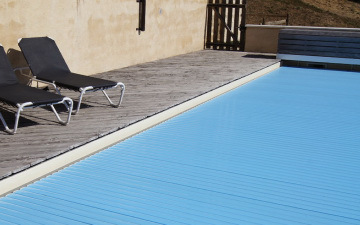 Solar Pool Covers: primary function is to warm the water during daylight hours. They are the only type of cover that actually does this. As a barrier to leaves, debris, etc., however, they are limited by the fact that they float on the water and therefore do not provide a total seal – although many of our customers report that they are very effective at reducing leaves in their pool. 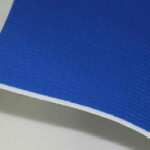 Thermal Pool Blankets: primary function is to retain the warmth of the water. They are the best type of cover for this. Like solar pool covers, they also float on the surface of the water, so their barrier to leaves etc. entering the pool is not absolute but it’s pretty good. 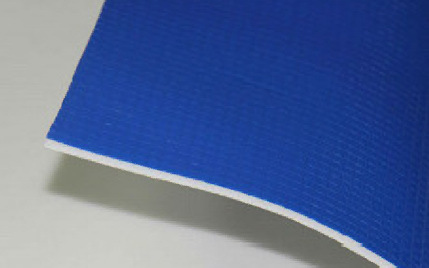 Slat Covers: primary function is safety. Their interlocking slats can withstand the weight of an adult, so falling into the pool becomes impossible. They also form a better seal than either solar covers or thermal blankets. And, since they’re automatic, they’re also very cool. The downside, though, is that they’re also very expensive, with prices running from around $2,500 and up to $8,000. Leaf and Debris Pool Covers: primary function is keeping leaves and debris from entering the pool. They won’t warm the water, they won’t retain the heat, and no-one’s going to think your pool belongs to one of 007’s wealthier arch-enemies. But, when it comes to keeping out leaves, debris, and wildlife they’re ace. The main reason they’re so good at this is because leaf and debris pool covers don’t float on the water; they fit completely over the pool. They are secured to the pool surround by detachable straps and fittings that are then drawn taught so that the cover is stretched to fit flush with the pool surround. 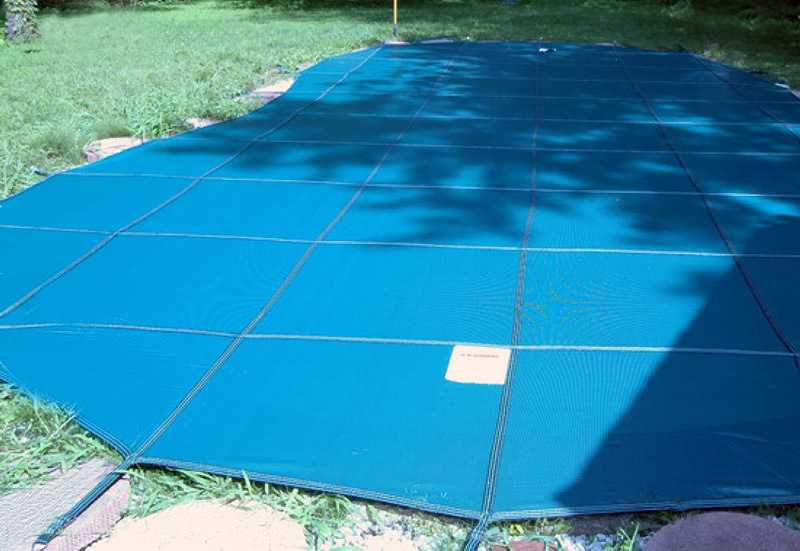 Leaf and debris pool covers are made from fine mesh woven polypropylene or polyethylene fabric (hence why they are also called mesh covers). The mesh allows rain water to pass through the cover while leaving the leaves, debris, bugs etc. on the outside. Because the leaves are kept from contact with surface water, they are easily blown off by any wind – or by a little manual assistance from a broom or leaf-blower. 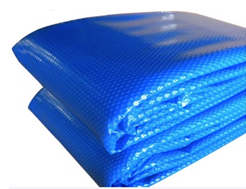 Leaf and debris pool covers are lightweight (usually weighing not more than 10k for a standard size pool), don’t require a roller, and can usually be fitted by one person. That said, they do take considerably longer to fit than a solar pool cover or thermal blanket – either of which takes less than a minute with a roller. 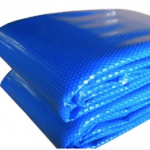 Leaf and debris pool covers are available and suitable for both in-ground pools and above ground pools. If mesh covers have a weakness, it is that when leaves and debris land on the cover and are not blown away or removed, any rain water landing on them inevitably washes minute particles, bacteria, and spores from them into the pool rather like a drip-filter coffee percolator. So, although the mesh keeps out the big (and even little) stuff, there’s a much greater chance of opening your pool and finding algae. And, even if you’ve taken the correct steps to keep algae at bay, there will still be a layer of very fine debris at the bottom of the pool that requires cleaning. Are They Better Than Solar Pool Covers? In some ways, yes; in other ways, no. Solar pool covers are designed primarily to warm the pool water. Yes, they also help keep prevent leaves and debris from entering the water, but that’s a secondary benefit. The main downside of solar pool covers is, that they don’t provide a complete sealing of your pool and, if more they get disturbed by the wind, they can expose part of your pool and let in debris. Also, because they are solid, rain water collects on the cover surface along with slimy wet leaves and other detritus – much of which runs the risk of sliding off and sinking into your pool when you remove the cover – unless you remove it first. The main downside to debris and leaf covers is the time they take to take off and put back on. If you have a pool that is particularly prone to a high level of leaves and debris, and, especially if you generally only use your pool at weekends, then a mesh cover can make sense. However, you could also consider double dipping and do both – use a leaf and debris mesh cover over the top of your solar pool cover. It’s not as perfect a solution as a solid pool cover, but it’s a lot easier to put on and take off, it’s cheaper, and your backyard won’t look as if you’ve stretched a tarpaulin over your pool. We have had a blue pool blanket before and a roller. The blanket disintegrated into pieces after a couple of summers and the roller weakened into uselessness. The stand was very poorlyrics made and became rickety. Now we are looking into a mesh to prevent ducks from visiting and leaving droppings in the water. However we also want it to be safe . The fibreglass pool is kidney shaped built 30 years ago. No fencing as the ground is elevated with decking. What is the best thing to do before we go away for five weeks this summer? I am worried about twin 3 year old boys next door although we have tall fence and then another enclosure leading to the pool but not a fence surrounding the actual pool. Thank you for your advice. What is the best way to choose and procure the right leaf and debris cover for a non-rectangular pool? I have a problem with ducks in the autumn/winter. Need to cover my pool solely for this reason as leaves and debris are not a problem. Live on acreage with a 20m x 5m pool (approx width as there are edges and curves). Would like a quote for mesh cover that allows rain water through but prevents ducks from accessing water.